It’s obvious the Environmental Protection Agency (EPA) has way too much money to play with. Following yesterday’s news that the EPA was funding research to reduce air pollution emissions from cooking on propane fired barbecue grills, the latest research grant is aimed at hotel showers. Researchers at the University of Tulsa were awarded $15,000 to develop a wireless device that will allow water use from showers to be measured and reported to both the hotel guest via a smartphone and to hotel management. According to the grant, hotel guests waste millions of gallons of water each year and it’s hoped that guests will reduce their water use when they realize the amount of water they are using. The research on propane gas grills involves modifying the barbecue grill design to reduce particulate matter that’s emitted during cooking especially when the fire hits the grease from the food. The Chemical and Environmental Engineering department at the University of California, Riverside, received $15,000 to develop a two-step process to reduce particulate matter during barbecuing. The fist step involves reducing the amount of grease that hits the cooking flame by temporarily inserting a tray between the meat and grill just before flipping. Since the tray is cooler than the grill surface it will minimize the amount of grease emitted from the meat, resulting in less smoke and particulates released into the air and inhaled by the cook. The tray is removed immediately after the meat is flipped. The second step involves an air filtration system. Only the EPA could devise projects that are so detached from reality. Hotel guests pay a premium for lodging and will resist being spied on by hotel management for water use. In many hotels, a small card is displayed in the bathroom to remind the guests that water conservation is important. Some hotels go a step further and suggest that guests can opt out of having the towels and sheets replaced daily. 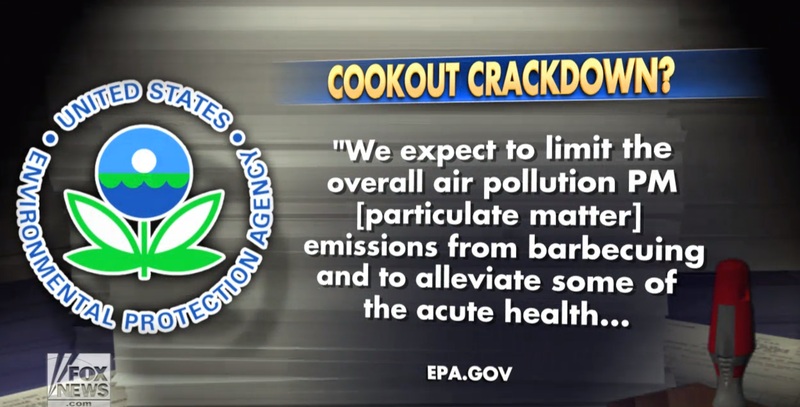 Addressing emissions from propane barbecues is even more ridiculous. Backyard cooks are not going to go through an extra step before flipping the meat. Not only does that step increase the possibility of getting burned but the tray also becomes an additional item that needs to be cleaned. Finally, the elaborate filtration system would add to the cost and maintenance of the grill. Funding make-work research projects exposes the incompetence and waste at the EPA.